I wasn’t obligated to try yet another “thing” in my room. I would be given better materials and funding to work with. Other math teachers in my building would see the enormous benefits of the technique. For those of you unfamiliar with the term “whiteboarding” it is very simple. 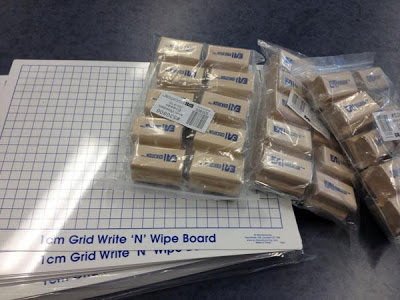 Students are given a miniature whiteboard, a whiteboard marker, and a small eraser. Responses are elicited in various ways from the students–using the board as a medium. There are several ways–and question types–that create different classroom atmospheres. It is my goal, in this much belated post, to detail the three styles of questions that I have used. Each carries with it a specific classroom environment. The first style of question I call a Basic Response. This is a classic “teacher asks, student responds” type of question. Short, sweet, and to the point. The great thing about the whiteboards in this case, is not the fact that they tap deep learning. (we’ll see ways for that later). The low floor (everyone can answer), variety of questions (you can ask almost anything), and relative anonymity (takes away from public response) make the response rate close to 100 percent every time. I have had students place a “?” on their board and hold that up as their response. It provides instant feedback to me about who needs the help–and how badly. I have students turn their boards over and hide their answer. When I see everyone is ready, I ask them to hold up their boards. I collect answers, and we muse on where the mistakes may have creeped in. I stress the importance of working individually on these types of questions. Having everyone respond at once cures the “smart kid answers all the questions” syndrome. After an answer is deduced and revealed, I allow the conversation turn to the mathematics. Often times I need to calm down the hum after a question. These types of questions are quick, and easily constructed. The second style of question I call a Dynamic Response. These questions usually appear in multiple parts. The first step has students create something mathematical according to certain parameters. It could be a set of data with a certain mean, a triangle with a certain property, or a quadratic with certain intercepts. The emphasis is on the creation. The response is dynamic because it involves a passing of the boards. Instead of showing–and getting approval from–the teacher, students swap boards and build, alter, correct, critique, or continue on their classmate’s work. This creation and solution builds deeper thinking models. It also creates a much louder and more active mathematical ecology. Some equate quiet with learning–me? Not so much. These types of questions are harder to create and should be thought about prior to entering an instructional situation. The tasks need to be small enough to fit on the board, but novel enough to stretch their thinking. Tasks like these might be more typically classified as “new” or “reform” math. (Both phrases appear as pseudo-insults to me). The question was inspired by a previous post, and formatted to fit the whiteboarding structure. The third style of question I call a Grouping Response. These questions are designed to have a key divergence or decision. I use this divergence to create groups within the class. Rather than explain the possible schools of thought on the board, I like to discover who thinks in which fashion, and get them to campaign for their thought pattern. When the class has been split, it also provides me a chance to spend time with a group of students who could not answer. Essentially the class is split into Type A, Type B, and No solutions. Sometimes I ask the students to choose a corner based on their response and explain why their answer is the most efficient. Other times, I ask students to find someone with a different response, and exchange rationale. The questions are designed to get peer interaction kick-started. The whiteboards ensure that everyone labels themselves in a category. Notice that students are still asked to compute or work with some procedural mathematics. The whiteboarding just facilitates an effective mathematical conversation while grouping kids not based on ability, but mathematical preference. My question categories came from my work on a presentation given in November 2012. The complete presentation slides can be found here. More question examples as well as other classroom benefits are also included. Whiteboarding is a great initial change agent. It can be used within a variety of classroom types and adapt to a variety of teaching styles. In the end, teaching mathematics is about creating a vibrant ecology where every student can be reached. Whiteboards have been a huge step toward that direction. I really like the 'dynamic response" style of questions for whiteboarding. There is a huge push for 3 part math lessons in my school board and this strategy would be perfect as both a "minds on" or a "consolidation" if you wanted. The whiteboard sharing would also be great as a forum for "peer checking" and "peer evaluation" by having them check the solution – and in some cases continue the sequence or extend the pattern or add new values abiding by same rules. How do you think that whiteboards could be used for math group problem solving? I'm thinking loosely about 'broken telephone' only with a math context and problem. Each group adds a detail and passes it on for the next group to investigate and add on…What do you think? 3) Recording. I like the students to have record of their group work. Whiteboard work is erased quickly. Those three things aside, I have thought about getting large boards and having them as group stations. Avery Pickford just wrote a very interesting post here http://www.withoutgeometry.com/2012/12/a-truly-group-project.html. It may be of help to you. I think these ideas have huge potential in creating a more interactive math room. One that mirrors the atmosphere of an English or Social Studies. I never thought of passing the board for a student to solve or check their work. I'm definitely going to remember and try that one. Thanks.